Ladies and Gentlemen welcome to a night of shaking souls and rhythm & blues. 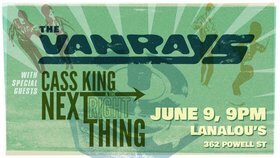 Don't miss the first live set for The VanRays, and Cass King & the Next Right Thing always rock the house! Join us, if you please. Motown sound and Stax sax take rhythm and blues and put a knife in its back. It's a Motown beat down in a shark skin suit. It's wailing like its gospel while they're laying in the boots. It's a curb stomping rhythm on the corner of control. It's a nod in the direction, when all the shoes had leather souls. And to when those shoes were twisting, to Otis and to James. And so now do, the VanRays too, we are here to do the same. You've seen these seven shady cats before, but not in this configuration! 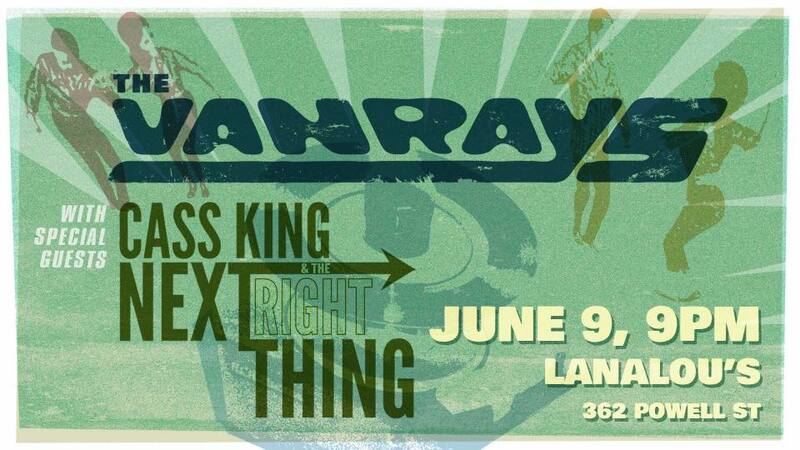 Cass King and the Next Right Thing combine classic 60s R&B swing with scrappy garage-punk energy. Vocalist Cass King, guitarist John Woods and drummer Adrian Buckley have played together for years in such bands as The Wet Spots and The Orchid Highway. Bassist Brendan Mooney tours internationally with numerous acts.